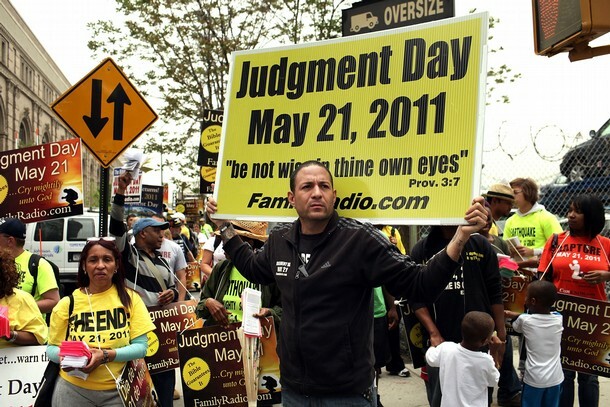 It’ll be very interesting to see what happens to Harold Camping‘s followers in the aftermath of his failed attempt to predict the “Rapture” (and subsequent end of the world). These people have embraced Camping’s prediction to the point of personally bankrupting themselves (like this 60-year-old retiree who spent his $140,000 life savings to buy billboards announcing the end) and will surely feel devastated, disappointed, humiliated, and confused by the fact that Camping was wrong. (Of course, the way Camping has put it, it’s really the Bible that’s on trial here since his interpretation is perfect.) The high degree of cognitive dissonance experienced by these folks who have shattered their own lives by following Camping is sure to have some significant aftereffects for many years to come. The individual believer must have social support. It is unlikely that one isolated believer could withstand the kind of disconfirming evidence that has been specified. If, however, the believer is a member of a group of convinced persons who can support one another, the belief may be maintained and the believers may attempt to [proselytize] or persuade nonmembers that the belief is correct. Festinger’s work has been significant for explaining the rise of earliest Christianity as well, as some have pointed to the Seekers to explain how the earliest followers of Jesus might have responded with increased missionary zeal even if he wasn’t raised from the dead (ignoring that the Seekers’ leader was still around to provide a new explanation). As it turns out, however, other examples of failed doomsday prophecies have not followed the same pattern—as shown in Jon R. Stone’s Expecting Armageddon, which examines a number of other groups with similarly failed prophecies, concluding that increased proselytism is far from the norm (not occurring in any other case). Instead, these groups have typically found other ways to rationalize the failed prophecy, whether interpreting it as “God’s mercy” or seeing a spiritual fulfillment or interpreting storms on the east coast as roughly equivalent to tsunamis. What I think Festinger may have overlooked in his particular case is how publicity-shy the Seekers initially were—they didn’t just increase in zeal, they went from a fairly closed group to a strongly missionary group. I hope we don’t entirely lose track of some of these folks who have jumped into Camping’s prophecy with both feet—it’s worth studying their responses after this whole thing fails to see how a group with a much stronger missionary emphasis (and much more public humiliation) responds to the prophecy fail. They also do not have the fallback that they did with Camping’s first prediction (1994), because with that one he’d said it was either that date or May 21, 2011. He (and the group) have left no such obvious outs for this one—they’ve committed everything to it, making it far more devastating when it doesn’t happen. But we really need to have some sociologists stay in contact with some of these folks (like this family—including the kids, who were already embarrassed enough) after the fact to see how they respond. It’s a great opportunity for some good research. My guess: Camping will do a mea culpa and explain that somehow his math was off somewhere (likely forgot to carry a “1”), but the day is still close. But I expect this example to be quite different from what Festinger observed with the Seekers (which I think was a more situation-dependent result rather than the rule): I expect that most of Camping’s followers will lose faith and drift away (given his negative stance towards Christian churches and his insistence that this is all from the Bible itself, it’ll be interesting to see whether those who leave the group retreat to other church groups or move towards agnosticism). Certainly some of them will rally together, lick their wounds, and try as best as they can to go back to “life as usual,” expecting the end to come soon but certainly more subdued in their expectation. I don’t expect them to redouble their proselytism, however, mainly because they’ve already fired that round. A few group members will find ways to rationalize this, but I don’t expect them to try to make more converts to Camping-ism as a result. In the end, I expect Camping’s group to wind up more like the Millerites, with the majority of devoted followers winding up devastated and leaving the group/faith as the group shrinks over the years. Don’t take that as a prophecy, though. I’m really just guessing. Thanks for this post. I’d never heard of this study. Often it is us (Jehovah’s Witnesses) who are held as the example.